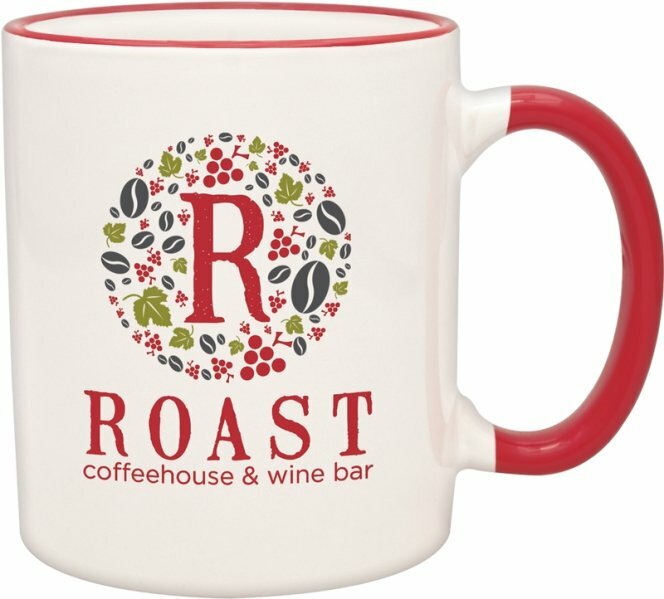 For a real eye catching promotion utilize this custom coffee cup customized with matching print & trim color. Features of the coffee cup are kiln fired ceramic construction, full grip C- handle and 11 oz. cup capacity. Overall size of the custom coffee cup is 3 3/4" h. Top diameter is 3 3/16". Bottom diameter is 3 1/8". You MUST order cups in whole carton increments. Cups are packed 36 units to a carton. Safe Pack Cartons are required, add $6.95 each carton. Price includes a one color print on two sides in an area 2 3/8" w x 2 5/8" h.
Three colors or more require a transfer print, expensive. Suggest using our four color cups for multi color prints. For economy we recommend one color printed cups.